Hi Everyone! Kathy here today with two fun projects I created using the Sweet Shoppe Collection. Sweet Shoppe definitely goes on the books as one of my all time favorite collections! I just adore the combination of colors! For my first project, I created a layout featuring my daughter blowing out her birthday candles last summer. I loved all of the papers, I wanted to showcase them all! I decided that a fun layered look would work! And of course I couldn't pass up using the fun garland! There are some great stickers with Sweet Shoppe included this cake and balloon! I used some Bumblebee twine to hand stitch the balloon string. 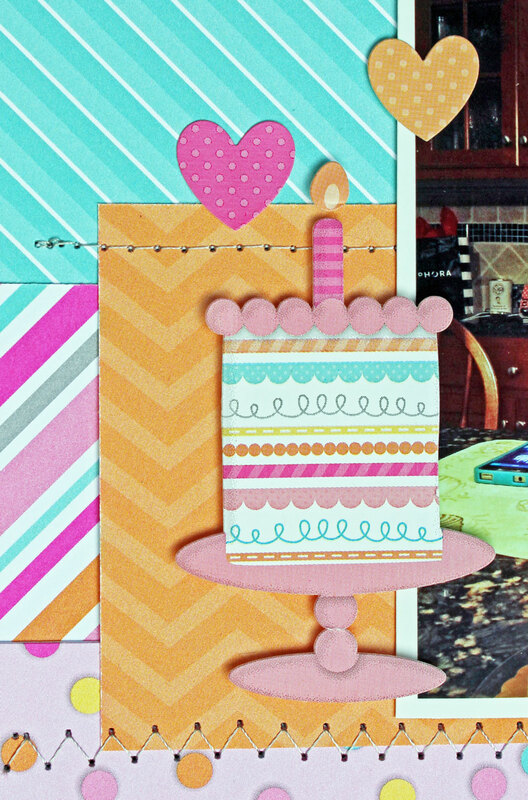 I also used some of the Sugar Shoppe Pixies to embellish my layout. They were the perfect addition! 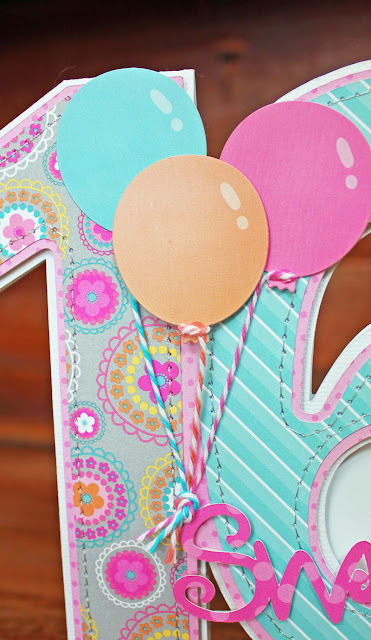 For my second project, I designed this fun shaped birthday card. 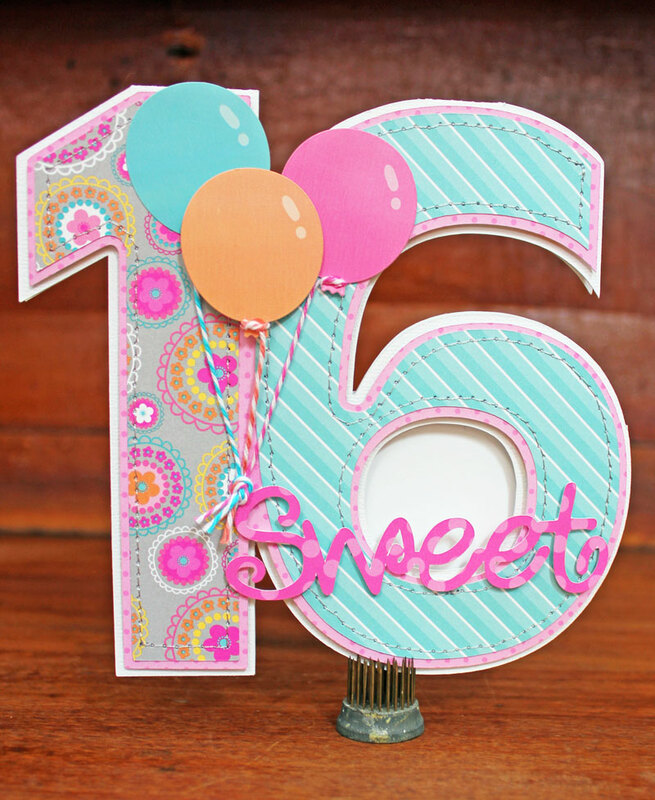 We've had a whole slew of Sweet 16 birthday parties this year! Everything from a simple dinner out with a couple of friends to full scale semi formal dress up parties! I'm just glad I have until the summer to come up with something, and am thankful that my daughter is thinking more along the lines of a PJ-clad, Just Dance-off kind of party! I created the card in 3 layers to show off more of the fun papers from the collection! 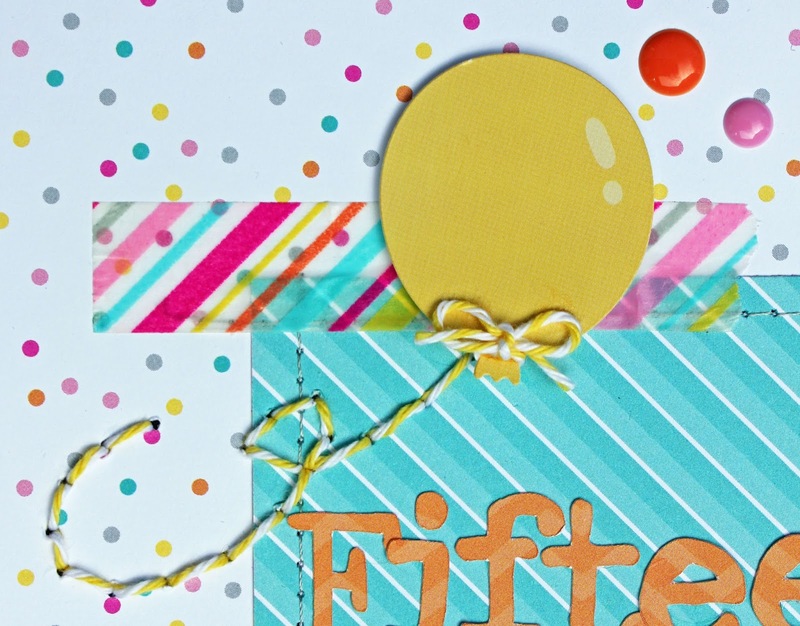 I added more of the balloon stickers from the Icon Stickers and tied them together with some Doodlebug twine! Now for something fun! I'd love to share the cut file I created to make this card! You can download it here! I hope you enjoy it. That's all for me today...make sure to keep checking in to see all of the Doodlebug Design Team's projects! Thanks for stopping by! SWEET photos and DELIGHTFUL layout Kathy - LOVE your page design and ALL the Sugar Shoppe pretties you have layered together!!! very sweet layout! All the details add so much charm! I just love the possibilities with this collection! Such awesome projects, Kathy! So fun, so colorful. so full of wonderful details! The number card is awesome!!! Would make a great party decoration too!! Will use this idea for sure! Thanks!! These are very awesome projects!! Thanks very much for sharing with us - Kathy Skou!! YOu are incredible! I love everything from Kathy! Super fan here!!!! <3 Thank you for the file! You totally rocked it, Kathy!! That layout is so fun and vibrant and I adore the 16 card! What a fun layout !! I pinned the gorgeous layout and card. what a great layout, I love how bright this collection is. very detailed. Your projects are AWESOME Kathy! I adore you layout with the stitching of the baker's twine and all the other fun details and your card is over the top amazing! LOVE IT!!! I love the colors in this collection it is so sweet it reminds me sherbert. Just so darn cute. 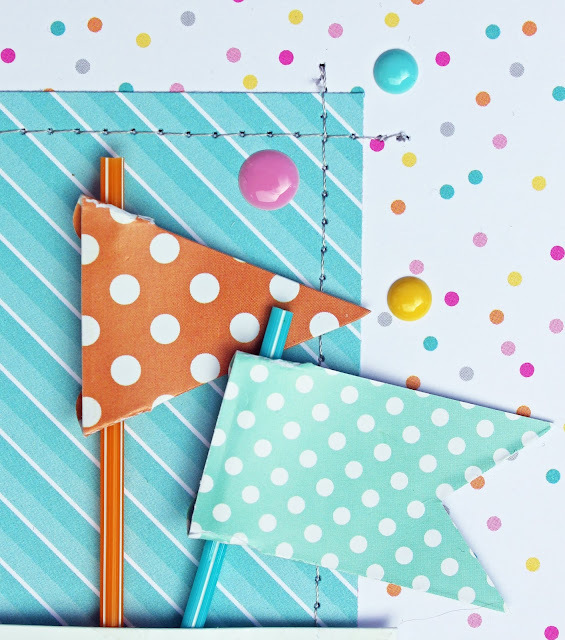 Kathy and the Doodlebug Design Team are CREATING CRAFTY DELIGHTS!!! Gorgeous projects Kathy! Love the card so much!